There's a distinct advantage to great cookware - besides what Emeril tells you... you can get a 'kicked up' reflective shot off the All Clad 6 QT stock pot lid. 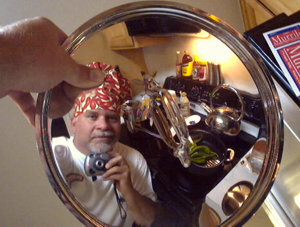 OK, so the chili chef's hat is overkill, but that's just my style. Bon Aperture!